I've always been bad in geography yet I had to pick Fiji as a marker to tell people where I come from – Kiribati. In fact, when I landed in Los Angeles the customs official assisting me asked me where I was from because he was "geographically challenged." The only explanation I had for him was, "I live on islands just north of Fiji." In Boston, Massachusetts, everything I did was for the first time! I was so nervous yet eager and excited to know and do things the Boston way. The weather was fine and Boston is a beautiful city. However, the air-conditioning was so cold in every building that I had to go outside often to get some heat. It was a thrill for me to learn from so many scientists during my five week stay in Boston. And I had a lot to learn, I was glad that their explanations were so understandable. I had a great time learning from them and I will use what I have learned to the best of my abilities to improve the conservation of our waters. Learning important monitoring techniques from them was crucial. Working with Randi Rotjan at the Aquarium, I learned how to use computer software to help organize and analyze data. But data analysis is only possible if you've collected the right data. 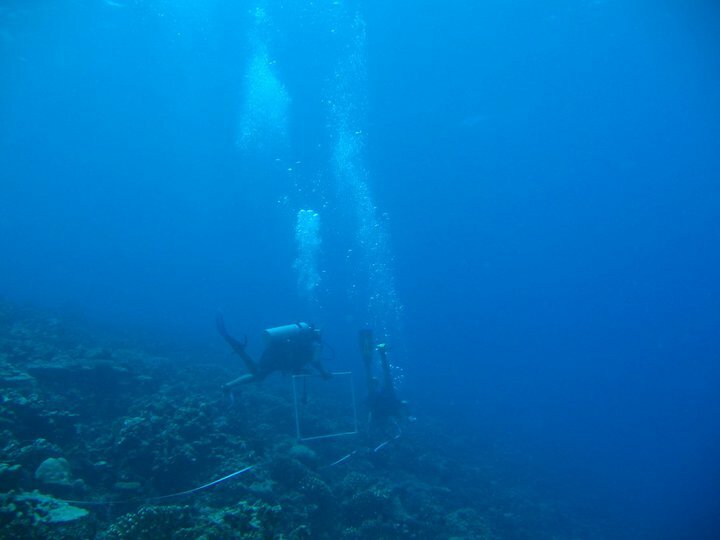 To better understand data collection, I had to stand in front of the Giant Ocean Tank with a transect laid down and count the fish so I could estimate the size and number of fish running within the transect. It was not easy but it will be a very useful skill. I even did otholith extraction. I've heard a lot about otoliths (tiny ear bones in fish) and how you can use them to tell the age of a fish, so I was glad to learn this skill. Another technique I learned is counting zooxanthelae (a type of algae that lives in coral) by using a dental Water-Pik to extract polyps out of the coral. I learned to examine the density of "zoox" in relation to the surface area of the coral that I extracted by counting the number of "zoox" under the microscope. Randi taught me how to use the analysis computer software, JMP, to sort out and analyze these kinds of findings. Examining zoox under the microscope. I am very thankful for many things during my stay. Firstly I would like to thank Alan Dynner for covering my travel expenses. Without his help, I wouldn't have made it here, so far away from my home. I would also like to thank Regen Jamieson for planning the schedule and preparations, along with Lydia Bergen, Heather Tausig and members of the Conservation department for being so helpful and kind. I extend my thanks to Barbara and Bill Burgess, New England Aquarium chairman, for hosting such a wonderful barbecue. I had a great time at the BBQ, giving me the opportunity to meet people like Greg Stone (New England Aquarium and Conservation International), Bud Ris (Aquarium president and CEO), Alan Dynner (Aquarium trustee and avid supporter of PIPA), Chris Stone (Global Conservation Fund, Conservation International), Peter Shelley (Conservation Law Foundation), Steve Bailey (New England Aquarium curator of fishes) and many other great people. Thank you to Randi Rotjan for her hard work teaching me. I never thought I could make it to the end, but I'm glad I survived. Also, I extend my thanks to Les Kaufman for his involvement as well the students in his lab at Boston University. I could not forget Rachel for the huge amount of work she did lecturing and guiding me while I worked at BU. Thanks also goes to Arjun and Zak for allowing me to shadow them there. I want to thank my superiors back home in Fisheries, Tuake Teema and Tukabu Teroroko for nominating me to come on this training trip, and Raikaon Tumoa and Secretary Ribanataake Awira for allowing my travel! Last but not least, I would like to thank Chris and Emily Bauernfeind for hosting me in their cozy apartment. I had a wonderful experience living with such wonderful people. I couldn’t thank you guys more! I thought staying for five weeks was long, but I guess not. I was struck by all the different scientists I met with their unique views and work programs who all share one common goal of conserving and preserving the oceans, something we all fear will disappear one day if they are not maintained and protected. All the people I met were wonderful and I hope to get to see them again and to work alongside them with the common goal of every conservationist!